Oh mercy. This casserole was delish! I found a website with a ton of bed and breakfast recipes and I think I'm going to be in trouble because I want to try so many of them! I needed to find a new recipe to bring to our first MOPS meeting of the year and I chose this one. I've never made a french toast casserole, but I've always wanted to, so this was my chance. As I wrote on facebook, I almost always try out new recipes when I go to gatherings. Do you do that? I mean usually you take a tried and true recipe to potlucks and meetings, but not me. I always want to try something new so I can have something new for the blog! Well, I am glad I tried this one because I can't wait to make it again. The original recipe calls for blueberries, but I wanted to do strawberries and it was definitely a good substitution. 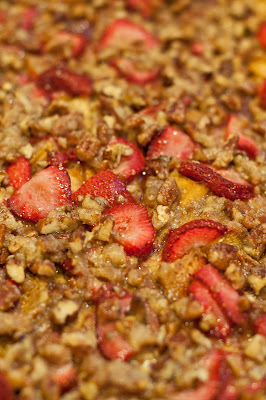 I bet you could use a lot of different fruits as the topping, blueberries, strawberries, blackberries, raspberries, etc. Definitely make this, even if you have to halve it for your family. It will be a hit! Preheat oven to 325 degrees F. Spread the bread cubes in a baking pan and bake for 15 minutes or until dry and hard. Remove from oven and let cool. Butter a 13 x 9 inch baking dish and pack the dried bread cubes into it. In a large bowl, whisk the eggs until lightly beaten. Add in the milk, cream, granulated sugar, vanilla, cinnamon, and nutmeg. Pour the egg mixture over the bread cubes, distributing it evenly. Push the bread down into the egg mixture until all the bread pieces are well coated. Cover and refrigerate overnight. When ready to bake, preheat oven to 350 degrees F. Uncover the casserole and bake in preheated oven for 45 minutes. **Remove from oven and sprinkle strawberries on top and then the pecan topping mixture. Place casserole back in the oven and bake for another 15 minutes until golden brown and bubbling. Serve immediately. You can choose to drizzle maple syrup on top if you want, but I thought it was just fine without it. *You can choose to use another fruit, the original recipe calls for blueberries. **Note: You may want to place the casserole dish on a baking sheet in case it bubbles over, mine did. I looks and sounds wonderful; you're brave; I prefer to try a recipe at home before serving ot to guests. Keeping this one when the gang is all visiting. Wow, this looks delicious!!! I love breakfast recipes. I can't wait to try it.